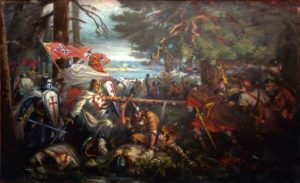 The Battle of Lake Peipus or ‘The Battle on the Ice’ was fought on 5th April 1242 between a coalition of western crusaders led by the Teutonic Knights against an army from Novgorod, Russia, led by Alexander Nevsky. The conflict was made famous by a Soviet film of 1938 directed by Sergei Eisenstein. 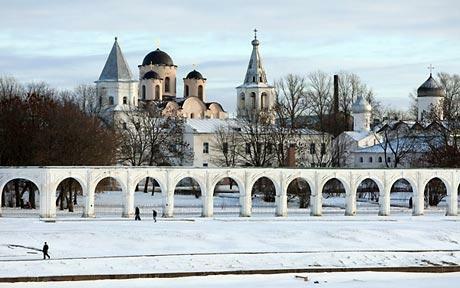 Alexander Nevksy appointed Prince of Novgorod, a Russian city with its own unique culture and proud history. Lead up to Battle of Lake Peipus 1242. From now on some new sets of episodes will be available exclusively on a website called www.patreon.com. This is a website where fans can support a podcaster, artist, musician, etc and pledge either a one-off payment or an ongoing amount per month. Up until now I have made available all content completely free of charge but I will begin to offer bonus material to all those generous enough to pledge $3/month (about £2/month). The money will be invested back into the podcast to cover e.g. purchase of books and hosting fees. The latest set of episodes of A History of Europe, Key Battles podcast covers the Baltic Sea; firstly its early history, and then the Northern Crusades. The armies of Germany, Poland, Scandinavia and Russia attempt to convert the Baltic pagans to Christianity and carve up their lands in the process. 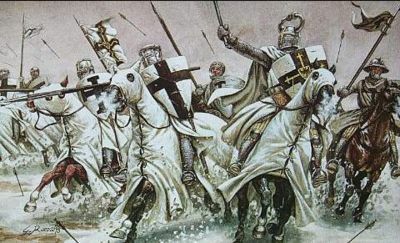 The culmination of the the set of episodes is the Battle of Lake Peipus 1242, or The Battle on the Ice, between the Teutonic Knights and Orthodox Russians of Alexander Nevsky. 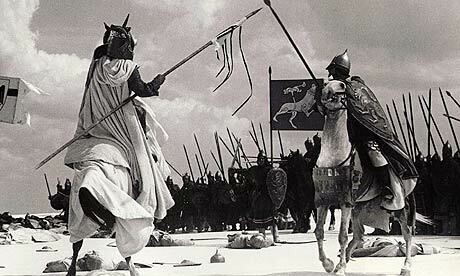 The battle is probably most famous for its representation by the Soviet director Eisenstein the film Alexander Nevsky.